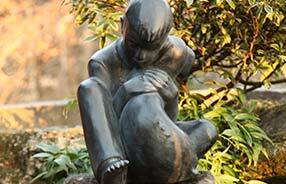 Made famous by the best-selling non-fiction novel, Midnight in the Garden of Good & Evil. Free Shipping. 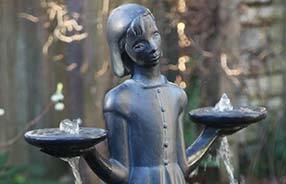 View the Bird Girl Fountain statue. Free Shipping. See the entire collection! All statues ship free. 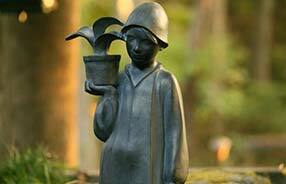 Potina is the exclusive supplier of the Sylvia Shaw Judson Collection garden statuary. Mrs. Judson was the sculptor of the famous Savannah Bird Girl statue that was photographed for the cover of the best selling non-fiction novel, Midnight in the Garden of Good & Evil, by John Berendt, and featured in the movie by the same title. For the first time ever, many of Sylvia Shaw Judson’s works, in addition to the Bird Girl, are becoming available for reproduction and purchase. 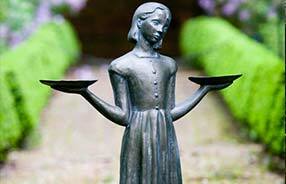 These statues, approved and permitted by her estate, are all copyright protected. Potina is proud and honored to offer these beautiful masterpieces of art to you!